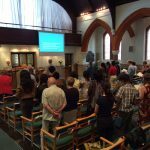 Services last around an hour and you are very welcome to join us whether you are familiar with Sunday worship or are entirely new to church. You’ll be able to follow the service easily from a printed sheet and we project the words onto a big screen. Those who are able are invited to stand at three points in the service: as the Bible is brought into church at the start, for the Offering and for the final Blessing, as well as for the hymns/ songs. There’s a hearing loop and wheelchair access throughout the building. We don’t wear ‘special’ clothes to church: come as you are, and sit anywhere you like! 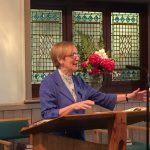 Worship is led by our Minister Rev Sue McCoan on the first and third Sundays, on other Sundays by our team of Lay Preachers, the Worship Group and by visiting Ministers. We have a drawing table for young children in the church and when there is a small group of children they go out for teaching and discussion, part way through the service, as Junior Church. Every Sunday we hear readings from the Bible: a Gospel reading and another reading from the Old Testament or the New Testament. Readings are in clear modern English. The readings are followed by a reflection or sermon, where we consider the text we’ve just heard and make connections with our life today. We say together the Lord’s Prayer and a short Prayer for the Week. We pray for individuals, for the whole church and for the life of the planet. On the first Sunday of the month you are invited to join in taking communion, remembering the sacrifice of our Lord Jesus Christ. We eat the bread as it is served to us and we drink the wine at the same time as each other. Singing is an important part of our tradition and we usually sing five hymns, old and new, in a morning service. We take an offering in which you are invited to make a contribution to the work of this church, but there’s absolutely no requirement to do so. There are occasional special collections for local, national and global charities. 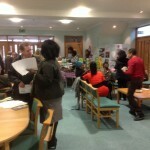 After worship you are invited to join us in the reception area for tea, coffee and biscuits and to chat. We’d love to see you!